Bucks County, Pennsylvania is the fourth most populous county in Pennsylvania. It is the home of Sesame Place amusement park themed after the popular children’s television show Sesame Street. It is also the home of nine wineries. And for lovers of covered bridges, Bucks County houses a treasure of twelve beautiful covered bridges. VisitBucksCounty has published an excellent do-it-yourself driving tour of these rare bridges. This tour of Bucks County's 12 remaining covered bridges starts at the Memorial Building in Washington Crossing Historic Park on the Delaware River. The Tour makes a large circle through Bucks County and is planned so the traveler can start at any one of the bridges. Built in 1875, this bridge is 86 feet long and was one of two built across Pidcock Creek. The second, Neely Mill Bridge, was removed in 1937. Loux Bridge was built in 1874 and is 60 feet long, the second shortest in the county. It was built of hemlock which was once plentiful in the area. Crossing Cabin Run Creek in Plumstead Township, this bridge stands 82 feet long and was built in 1871 by David Sutton, who built several bridges in the area. Built in 1872, Frankenfield Bridge spans 130 feet over Tinicum Creek, two miles upstream from the point at which the creek empties into the Delaware River. At only 56 feet long, Erwinna Bridge is the shortest covered bridge in the county. It was built in 1832 and is a good example of lattice-type construction. Built of oak in 1832, it is the only Bucks County covered bridge over the former Delaware Canal, which parallels the Delaware River near the Pennsylvania border. IMPORTANT NOTE: Uhlerstown Hill Road west of the bridge is closed during the winter months. All vehicular traffic must turn around and return to River Road. The road re-opens on or about April 1 as a one-way road. • Turn left, 4.4 miles to Rt. 412 / Main St. Located in Slifer Valley Knecht's Bridge was built of hemlock and is set on the route of the Penn family's famous Walking Purchase. Sheard's Bridge crosses Tohickon Creek near the village of Thatcher. Built in 1873, the bridge stretches 130 feet over the Tohickon. Mood's Bridge crosses the northeast branch of the Perkiomen Creek in East Rockhill. The original bridge was built in 1874. The bridge that stands today was built in 2007 after the original was destroyed by a fire in 2004. Originally spanning Pleasant Spring Creek, South Perkasie Bridge was moved to the safety of Lenape Park in Perkasie in 1959. A famous sign on the end of the bridge reads "$5.00 fine for any person riding or driving over this bridge faster than a walk or smoking a segar on"
Built in 1842 for a cost of $5,533.50 (more than $100,000 today), Pine Valley Bridge crosses the Pine Run Creek and is sometimes called the Iron Hill Bridge. • Turn left, 0.8 miles to Covered Bridge Park (Part of Tyler State Park). Schofield Ford Bridge crosses the Neshaminy Creek within the boundaries of Tyler State Park. At 150 feet long, it is Bucks County's longest covered bridge. The bridge was rebuilt after it was destroyed by fire in 1991 and is open only to foot and equestrian traffic. 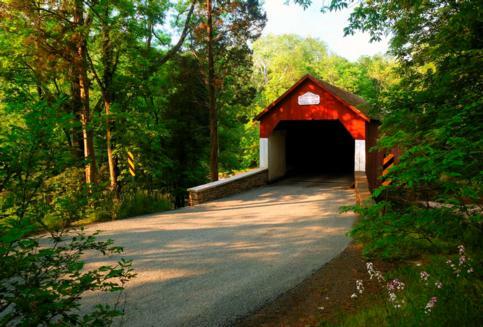 You've now successfully completed the Bucks County Covered Bridge Driving Tour!